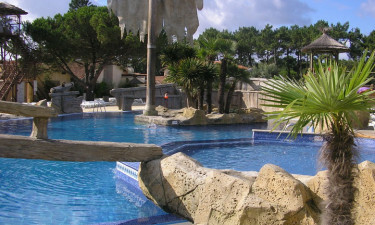 Camping Le Vieux Port is more than a just campsite. In this outstanding holiday village you can take the concept of a camping holiday to a new level and experience glamping at its best. Book your next holiday at this luxury camping with Lux-Camp and treat yourself and your family to an unforgettable experience. A superb evening entertainment programme offering everything from cabaret shows to an open-air cinema and magician's performances. There's something new every week! At Le Vieux Port there are more than 1,500 pitches to choose from. Stay in a spacious 1, 2, 3, or 4-bedroom mobile home with stylish furniture, full-sized beds and a fully kitted kitchen. Le Vieux Port's on-site water park offers exciting attractions for guests of all ages, including indoor and outdoor swimming pools, dedicated children's pools, a wave pool, relaxing Jacuzzis, and fun water rides. Le Vieux Port puts at your disposal three tennis courts, several basketball and volleyball courts, football pitches, table tennis facilities, children's playgrounds, and even a riding school so that you can practise your favourite outdoor activities or pick up a new hobby. Kids of all ages will be well looked after in the dedicated kid's clubs, which caters to children of all age groups and also to teenagers. Le Vieux Port is located near Messanges, a lovely seaside resort in the southern coast of France. You can easily reach the site from other French cities like Bordeaux, Biarritz, or Cap Breton. 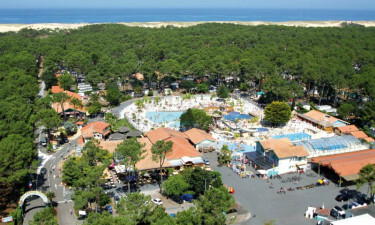 The campsite is 10 minute away from a beach where you can surf, sunbathe, or simply admire the breathtaking beauty of the Landes coastline. You can also cycle along a car-free bike lane and explore other villages or go on a pedalo ride at nearby lake. 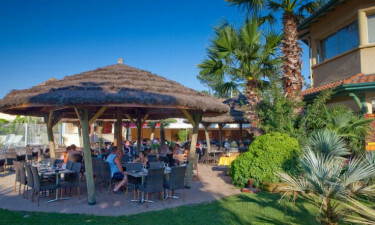 You won't need to leave the campsite to sample the local cuisine, as Le Vieux Port's restaurants are open for breakfast and dinner and offer a mouth-watering 'gourmet discovery' menu. Other options include a pizzeria, a snack bar, an ice-cream shop, and a bar featuring live music every evening. Visit Le Vieux Port's supermarket, which is stocked with quality groceries and other necessities. There is also an on-site souvenir shop selling holiday mementos, clothing, and all beach essentials.